This Toronto man had a rhinoplasty performed five years previously. 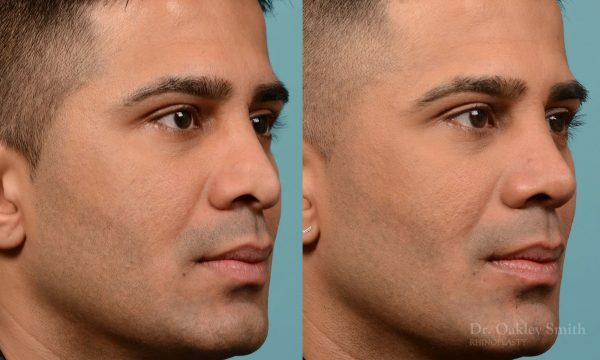 He recalls his surgeon took roughly forty five minutes to do both the aesthetic (exterior) and functional (interior) surgeries. He noticed no improvement with his nasal breathing and only the removal of his bump and narrowing of the base of his nose was evident. Overall he felt his nose looked worse. His surgeon offered to perform further surgery, but our patients’ trust had been lost so he declined. Looking over his pre-operative nose, several typical changes are visible. The bridge has been over resected in relation to his tip which creates an unattractive profile. There are subtle, but several minor irregularities on both his bridge and tip. This patient has thick skin, which means either over resection or asymmetric resection. 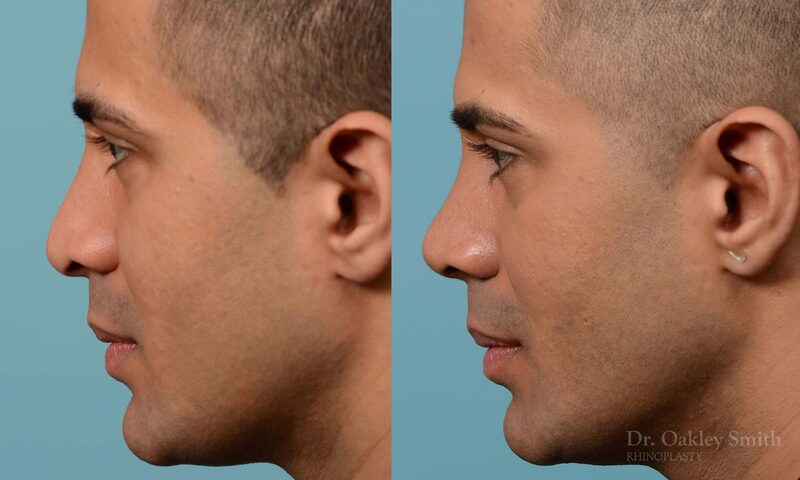 His primary rhinoplasty was done closed which increases the likelihood of inadvertent uneven resection of the tip cartilages. 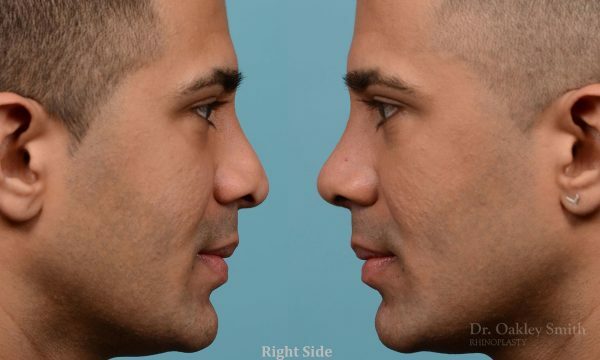 At the time of his revision rhinoplasty the explanation became clear. His cartilages had been unevenly excised and one had been mistakenly transected. Although portions of his septum had been aggressively removed, fortunately deep inside, surprisingly enough, cartilage could be harvested such that proceeding to his rib wasn’t necessary. By rebuilding his weakened tip cartilages and adding strength, his breathing was restored. A new tip was created using a sculpted piece of cartilage so that although his tip appears natural and pleasing, it is totally artificial. 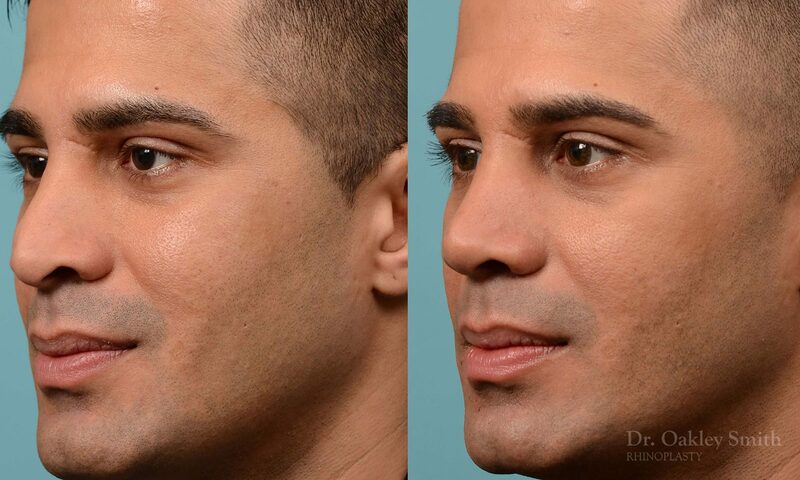 On bottom view, his right alafacial ragged incision was smoothed and further narrowing of his nasal base was obtained. Both he and Dr. Smith were delighted with his new nose, as revision rhinoplasty unfortunately often results in limited improvements. 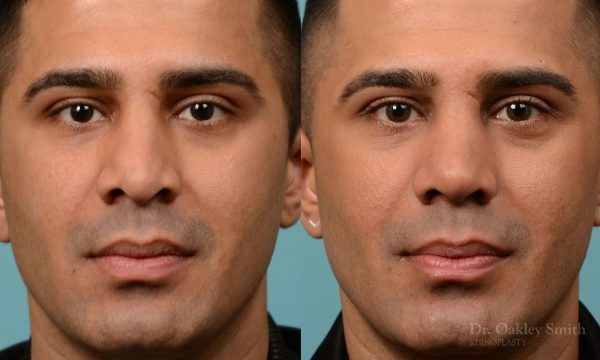 All too frequently the initially desired nose is no longer realistically achievable. The first surgery should be the only surgery. These before and after photos of a revision rhinoplasty illustrate some of the challenges faced by plastic surgeons who are experienced enough to tackle these complex cases.